The challenge this month is perhaps a bit obvious but I am going to ask …What is it to be at the half way mark? Oh by the way, I'm working on Sharon's course about Studio Journal. Right? isn't it the right opportunity to test what I've learnt so far? OK Let's go. First painting the pages, with bubble wrap to add some interest. Then glueing the palette, for inspiration. So far, so good. What next? What about finding some threads that would fit? 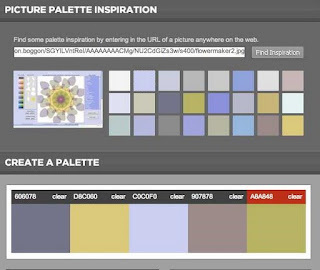 OK, that's easy too, although I did not know I had threads matching this palette. I just had to look at them differently to find they did fit. What next? Inspiration? oh, A friend has sent this nice postcard by Anne Cluzel. I said I wanted to translate it into textile, someday. The day might be right here. Technique? Fabrics? I don't have many fabrics that fit that palette, but I do have some felts, boiled wool and color catchers that do. Then obviously, the embellisher will step in. Oh, the difficult part is done. I just have to do it now. I had a pinker hue in mind for the arm and the head, but it was a color catcher, and it disappeared almost totally under the embellisher. I've tried to put a second layer, but it kept disappearing. So I applied a greener felt, which worked OK. The background of the dress is a sturdier color catcher. With little bits of silk on top. I like the skin tone. It goes with the project! I look forward to seeing the handwork on it. I sure wish I had your imagination! J'adore cette technique qui consiste à transcrire dans un journal les idées du moment et surtout ton imagination. Continues à nous étonner. Love what you are doing, I am having trouble this month and the Studio Journal is getting way behind, I just dont seem to have time to really get at it. 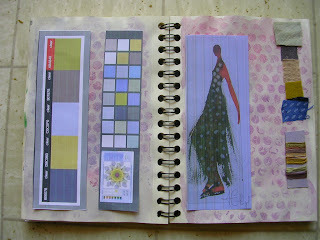 I love the pages of your studio journal, the step by step thought process makes it sound like I could do that. Love your embellished piece, very soft. I'm sure Sharon B's stitch dictionary will give some ideas for stitches. What is the cloth that keeps disappearing, a colour catcher?? Your comments and your work are very inspiring - an excellent use of journal to show your creative journey.